The term "low fat desserts" almost seems like an oxymoron, doesn't it? It's not though. Even if you're losing weight you can still have your cake and eat it too. What follows are some suggestions for baking your own delicious, decadent, low fat desserts. Here are some wonderful recipes for low fat desserts including Angel Food Cake, Chocolate Walnut Cake, Banana Split Cake, Light Vanilla Cheesecake, Rhubarb-Strawberry Pudding and Blueberry Cobbler. Mix powdered sugar and flour and set aside. In separate mixing bowl, beat egg whites, cream of tartar, vanilla extract, salt, and almond extract at high speed until well blended. Gradually add granulated sugar, while beating at high speed. Beat just until sugar is dissolved and egg whites stand in stiff peaks. Do not scrape sides of bowl during beating. *Fold in flour mixture, a little at a time, with a rubber spatula until flour just disappears. *Pour mixture in unprepared 10" tube pan. Serve with fresh cut fruit or berries. Prepare cake pan(s) with cooking spray and set aside. In a mixing bowl, combine cake mix, yogurt, milk, oil, eggs, and pudding mix. Mix well. 1 Package of fat-free, sugar free instant vanilla pudding, prepared. Prepare the pudding as directed. Cut all fruit into bite sized chunks. 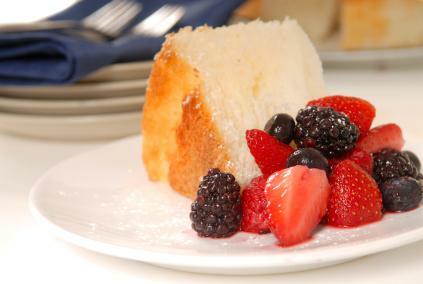 Cut the angel food cake into bite sized chunks. Separate all ingredients in half. Layer ingredients as follows: half of the angel food cake, half of the pudding, half of the bananas, half of the cool whip, half of the strawberries. Repeat. In a large bowl combine cream cheese, tofu, Splenda, liqueur, cornstarch, and vanilla extract. Bake at 225F for 1 hour and 20 min or until center is set. the inside edge of the pan. Turn the oven off; return the cake to the oven for an additional 2 hours. Chill overnight, do not cover. In medium saucepan, combine sugar and orange juice. Bring to a boil; stir in rhubarb slices. Return to boil; reduce heat and simmer, covered, for 5 minutes or until rhubarb is tender. Drain rhubarb, reserving syrup. Add water to syrup to measure 2/3 cup. Return syrup to pan. Stir together cold water and cornstarch; add to syrup and stir well. Cook until thickened and bubbly. Cook 2 more minutes. Remove from heat. Gently stir in rhubarb and strawberries. Cool at room temperature for 30 minutes. Cover and chill for at least 2 hours or up to 4 hours. Per serving: 85 Calories, 0 g Fat, 0 mg Cholesterol, 3 mg Sodium, 21 g Carbohydrate, 2 g Fiber, 1 g Protein. Serving Suggestion: Although a bowl of this fruity dessert is delicious by itself, it can be served over low fat vanilla ice cream, frozen yogurt or angel food cake. Preheat oven to 400 degrees. Coat a 13" x 9" baking dish with cooking spray. 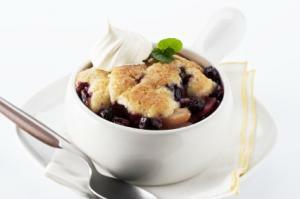 Combine blueberries, sugar, 2 tablespoons flour, lemon rind, lemon juice and vanilla in large bowl. Stir gently and spoon into prepared baking dish. For topping: Combine 1 cup of flour, baking powder and baking soda in a large bowl; stir well. In medium bowl, combine yogurt, 2 tablespoons lemon juice, margarine, 1 teaspoon vanilla and egg whites. Add to dry ingredients and stir until just moistened. Drop dough by tablespoonfuls onto blueberry mixture. Bake for 30 minutes or until filling is bubbly. If you'll be creating your own low fat desserts, you might try substituting fattening items with some that are a bit healthier. For instance, instead of greasing up a cake pan, use a bit of cooking spray. Not only does the spray have less fat than oil, but it gets into all of your pan's nooks and crannies, making it easier for your low fat dessert to slide out without damage. Cream cheese: Use low fat or fat free cream cheese instead of regular. Heavy Cream: Whisk two tablespoons of flour into two cups of skim milk. Whipping Cream: Use chilled evaporated milk. Butter: Use applesauce or margarine. While removing or reducing the fat in a dessert does not make it calorie free, lightening the recipe can make it easier to include delicious desserts in a low-fat diet.